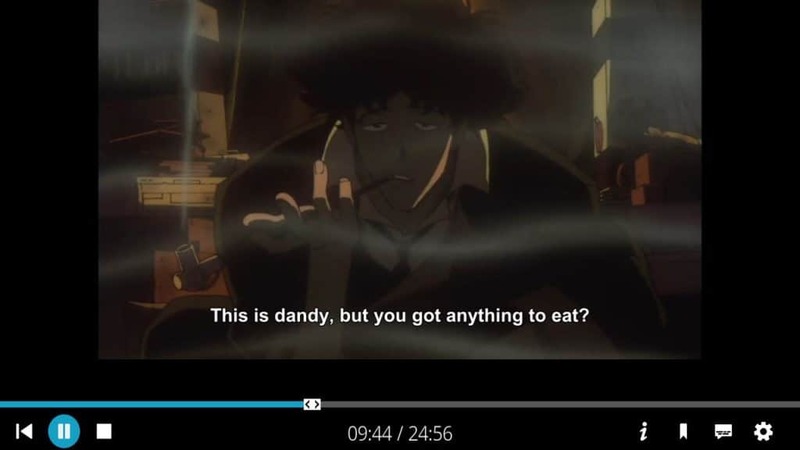 Crunchyroll has all of the best anime on the web, collected in one place and subtitled for an English-speaking audience. If you’re tired of watching your favorite series on the small screen, the Crunchyroll Kodi addon can help you get the latest episodes playing on your TV. Here’s how to set things up. Please note that you’ll need a Crunchyroll premium account for this addon. As of June 2018, the Crunchyroll Kodi addon was officially taken offline. In June, Crunchyroll sent a notification to Github, asking the Crunchyroll Kodi addon developer, Yoshiofthewire, to remove the addon. Crunchyroll’s complaint in the matter revolved around what it saw as a “bad faith” copying of its code in some of the repository files. Instead of fighting it, Yoshiofthewire decided to take down the addon for good. He explained in detail what happened to the addon on the official Crunchyroll forums, where users responded with a great amount of displeasure. Does this mean the Crunchyroll addon is gone for good? Not at all! The addon was forked several times and in different locations. We have updated our installation guide to reflect multiple download locations for the addon, just in case it gets taken down in other locations as well. To note, the Crunchyroll Kodi addon is a free, legal addon. The addon requires a subscription to Crunchyroll and does not violate any copyrights. Crunchyroll sought the take-down of the addon for reasons unrelated infringement of their licensed content. Kodi is a streaming media app that lets you watch movies and shows on your tv or mobile device. You can add content to it by downloading videos or installing addons from a huge library. It’s a fast, easy, and free alternative to subscription services like Netflix and HBO Now. One of the biggest reasons we recommend Kodi is that it will run on almost anything, from your game consoles to Roku and Fire TV devices. 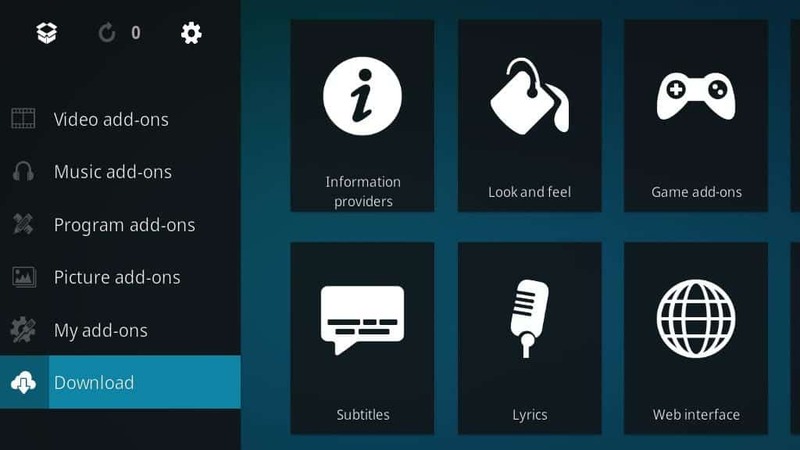 The latest version of Kodi is 17.4, and it’s available to download for free right here. 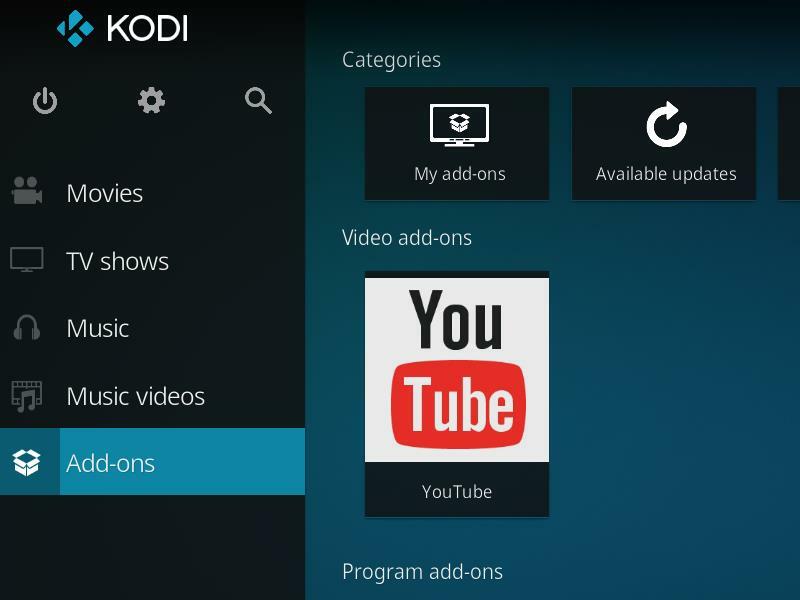 Read more: What is Kodi and how can you use it? Before you begin, you should think about how you’re protecting your streaming media devices. We strongly recommend you take measures to ensure your privacy and protection. ISPs are trying to overturn net neutrality in order to monitor what their customers watch on the internet, and hackers routinely launch new and sophisticated man-in-the-middle attacks to install malware and steal information. In many cases, the only possible protection is to use a VPN. After reviewing the most popular VPNs available, we recommend you sign up for IPVanish and install it on your Kodi streaming device. There are a lot of reasons why we recommend IPVanish specifically, but their fast servers and more than 100 server locations make them the go-to option for online streaming. In fact, IPVanish is the only VPN client that supports Amazon’s FireTV and Fire Stick. They also provide thousands of servers all over the world, helping streamers bypass unfair restrictions on watching region-locked content. Don’t risk having your ISP restrict your bandwidth because they think you’re watching too much Dragon Ball Super. Once you’ve downloaded and installed IPVanish, take a look at our guide to using Kodi with a VPN. 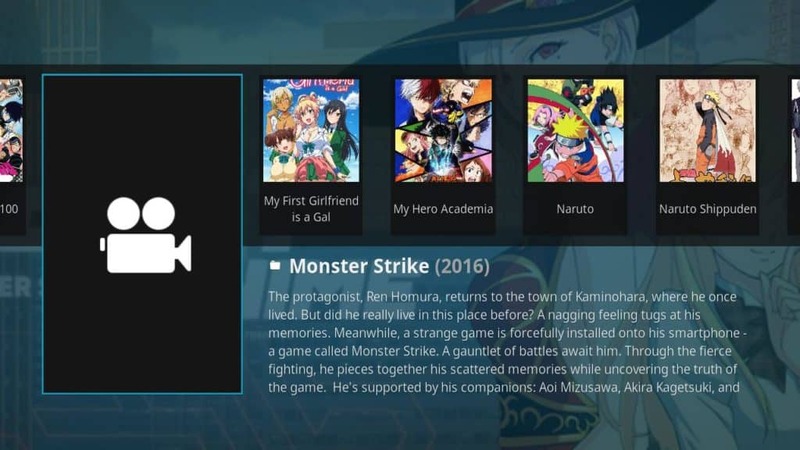 The Crunchyroll Kodi addon is available for download from the video section of the Kodi repository. 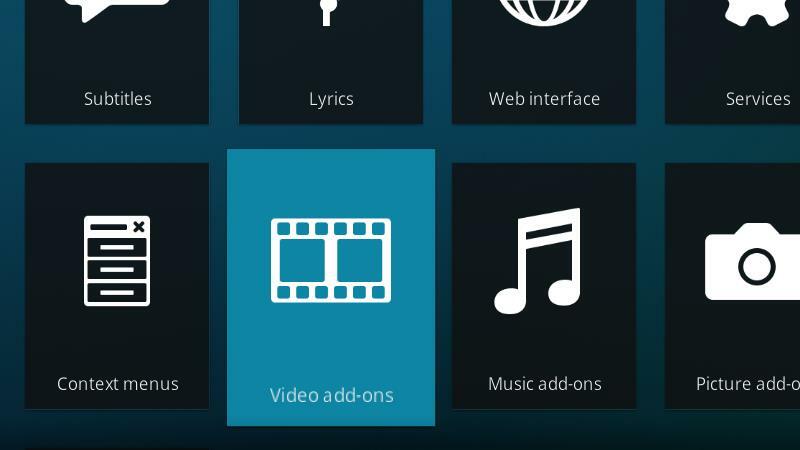 To get started, you’ll need to launch Kodi and have it open to the main screen. Next, click on the addons menu item from the main menu to the left of your screen. You may have more menu entries on your Kodi build, as I’ve turned off a lot of the ones I don’t use to reduce clutter. Then click the Download menu item at the bottom of the list. Browse through the list until you come to Video addons and click it. 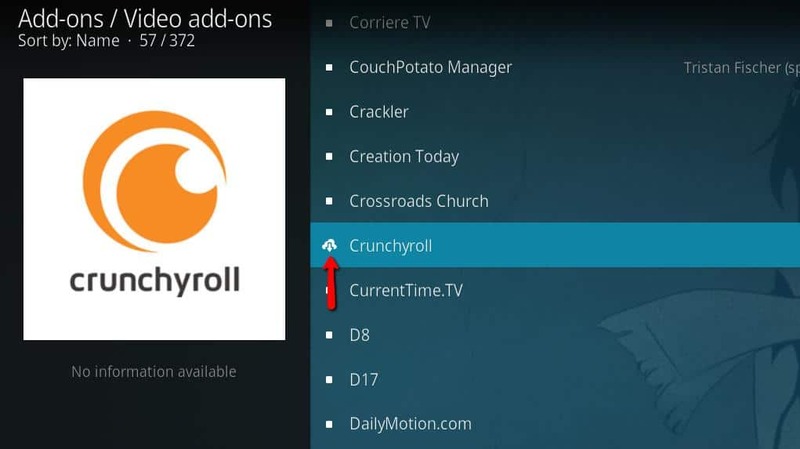 Scroll through the list of Kodi video addons until you find Crunchyroll, and click it to open the installation screen. Click the Install button in the lower right-hand corner. 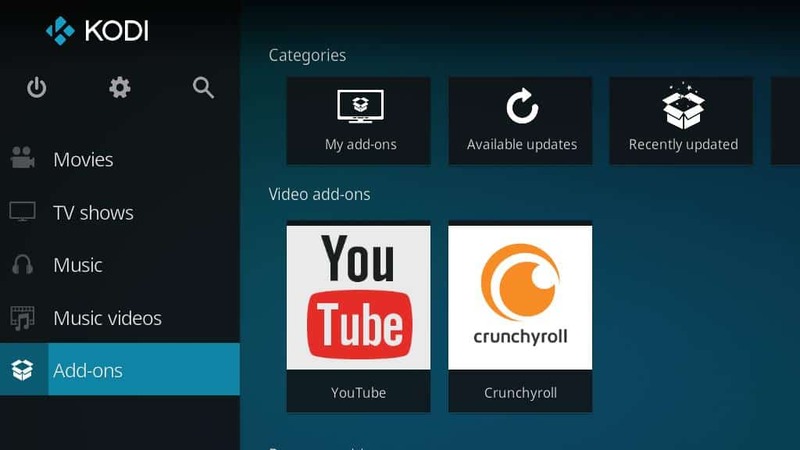 You’ll be taken back to the list of Kodi video addons, and the Crunchyroll icon will change when the download begins. 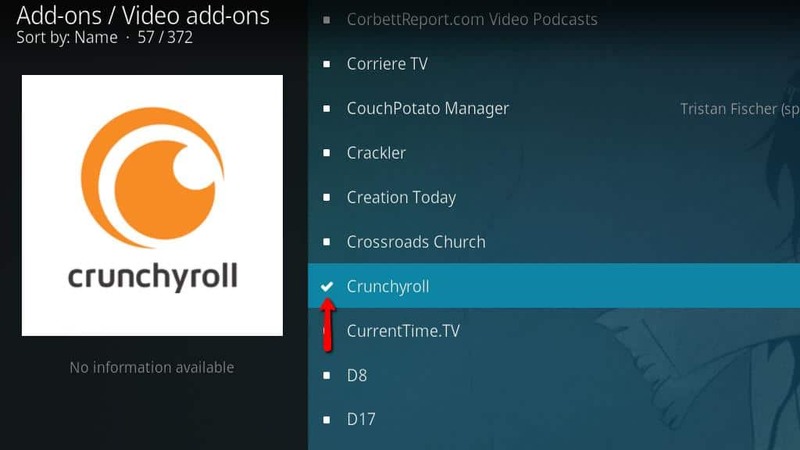 After the Crunchyroll Kodi addon is installed, the icon will change to a check mark as above. Now, when you look at the installed addons in the Kodi main screen, you’ll see Crunchyroll listed along with the rest of your video addons. If you find Crunchyroll to be missing or won’t install from the official repository, here are some alternative download links for the zip file. 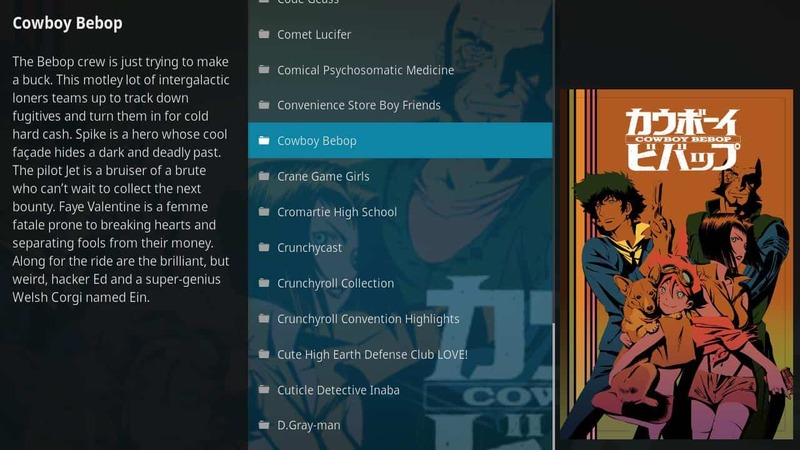 We will add more alternative sources for the Crunchyroll Kodi addon as they become available. 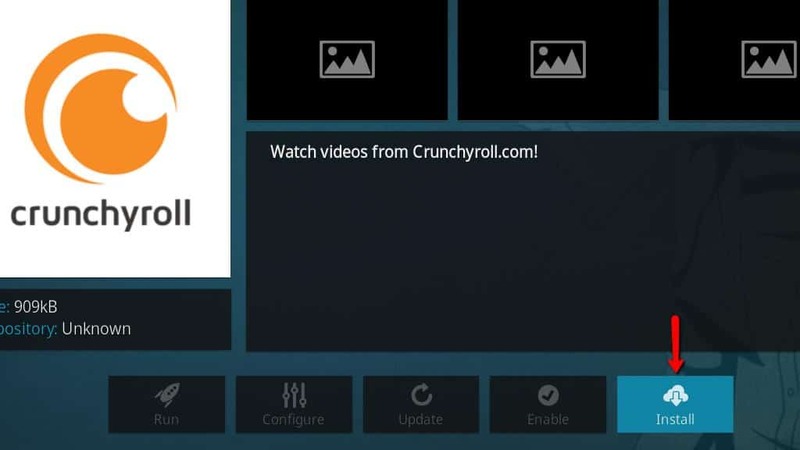 After the Crunchyroll Kodi addon is installed, you’ll need to set a few things up before it’s ready to use. Start by opening the Crunchyroll Kodi addon from the addons menu. 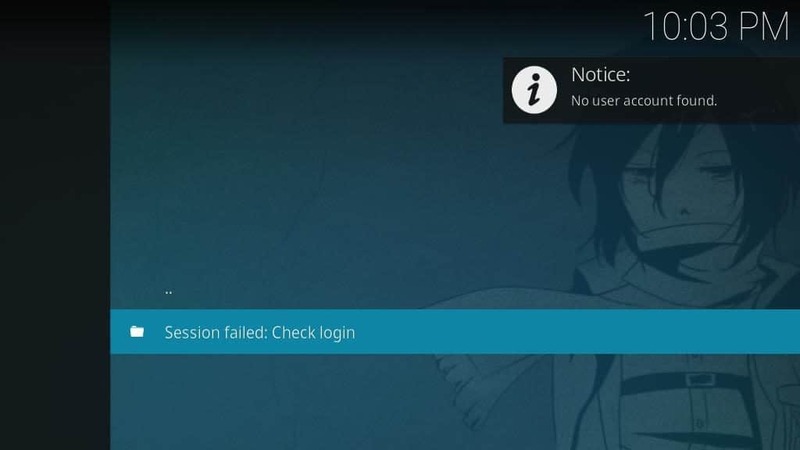 The first time you open the Crunchyroll Kodi addon, you’ll see an error message. This is normal, since you haven’t supplied the login information for your Crunchyroll premium account yet. The easiest way to open the addon menu is by moving your mouse all the way to the left side of the screen while Crunchyroll is open. This context menu is also the only way to search for your favorite anime by name. For now, click the addon settings menu item. The Crunchyroll settings screen will open. Now you need to enter your Crunchyroll premium account information in the Username and Password fields. You might also want to change a few other settings while you’re here. Video quality should probably be adjusted from the default of 360p, unless you’re watching this on a very small screen or desperately need the bandwidth. I tested Crunchyroll in both 1080p and 720p, and they worked well with no real buffering delays. Force language change can be set to whichever language you prefer to read your subs in. 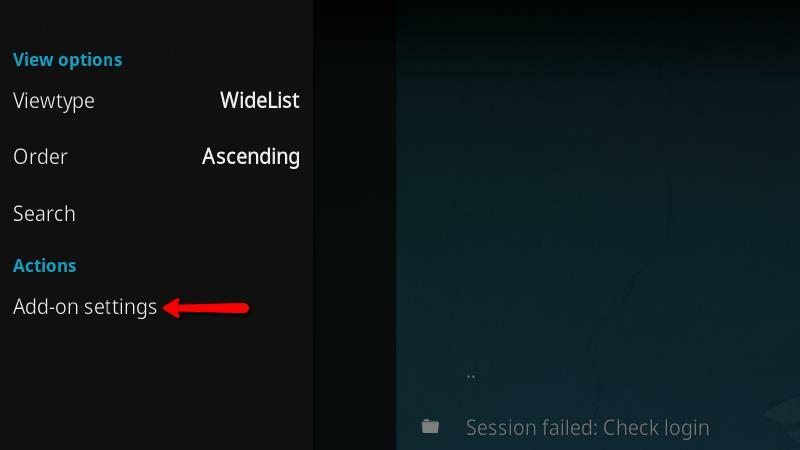 By default, it pulls your preferred language from your Kodi settings. Queue type will change how your Crunchyroll queue is displayed, either by episodes or grouped into seasons. This might be important if your Crunchyroll queue is extremely long. When you’re finished, click the Ok button to save your changes and return to the previous screen. 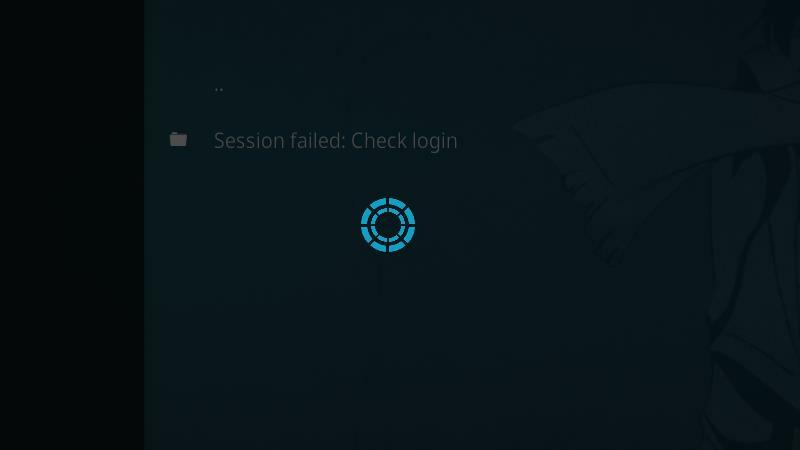 After you’ve changed the settings, click anywhere on the screen to force Crunchyroll to try to login with the account information you supplied. You’ll know it’s working if you see a progress spinner. 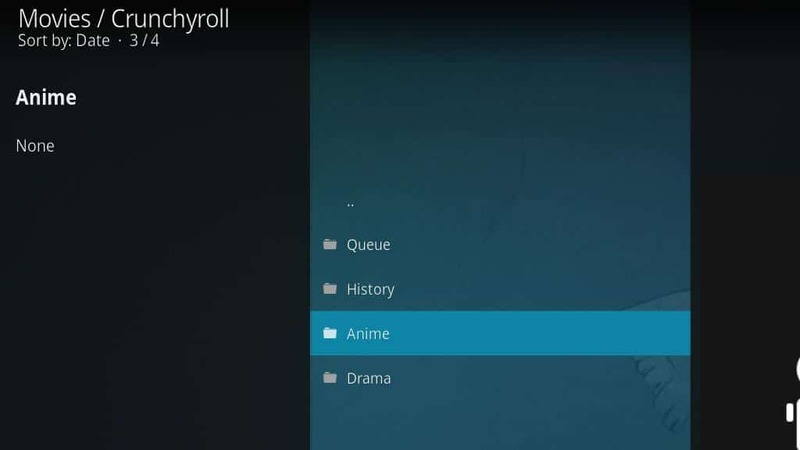 Now you can browse through your Crunchyroll queue, or scroll through every available show. In my opinion, this addon really works best with your Crunchyroll queue. There are a few filtering options so you can try to narrow things down and find new shows, but the sheer amount of titles can make it frustrating. 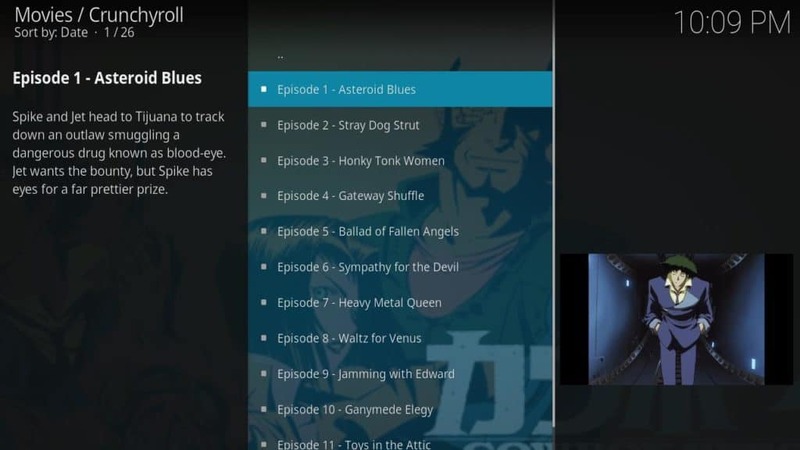 Now that everything’s installed and configured, you can use the Crunchyroll Kodi addon to watch your favorite episodes. The default view in the Crunchyroll Kodi addon is a big, long list. This makes browsing titles a bit easier, but in order to change to the next page you have to scroll back up to the top and select the Load more… menu item. The Crunchyroll Kodi addon also offers a poster view. You can enable poster view in the context menu to the left, but you have to do it individually for each screen. It’s set to list by default, but I think the poster view looks nicer on every device I tested it on — my only complaint is that ugly film reel icon. Once you’ve selected a title to watch, you’ll be shown all of the available episodes for each season. Click any episode to start it streaming. Old shows that only offer standard definition episodes are letterboxed, although a few series got HD remasters. 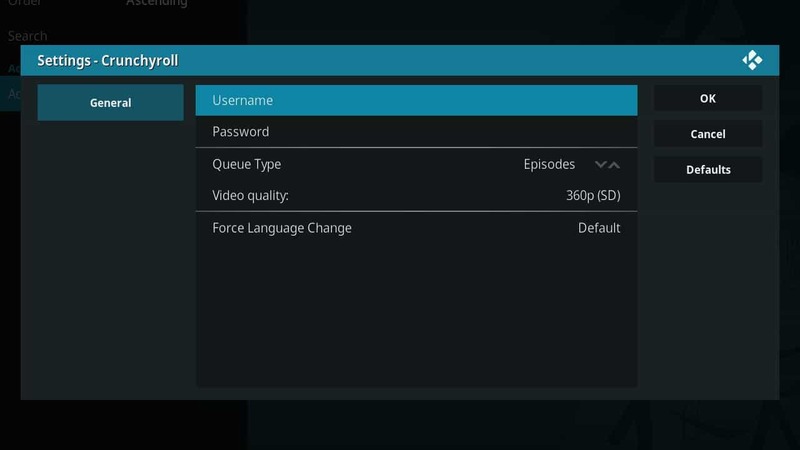 All of the controls in the Kodi player work with the exception of subtitles which, as you probably expect, can’t be turned off since they are burned into the video. That’s all there is to getting the Crunchyroll Kodi addon up and running. If you’re a Crunchyroll premium subscriber, there’s no reason not to get this addon. The interface needs a bit of work, but it will absolutely get the latest anime streaming on your tv. As long as you make the recommended changes, I think you’ll really like this addon. 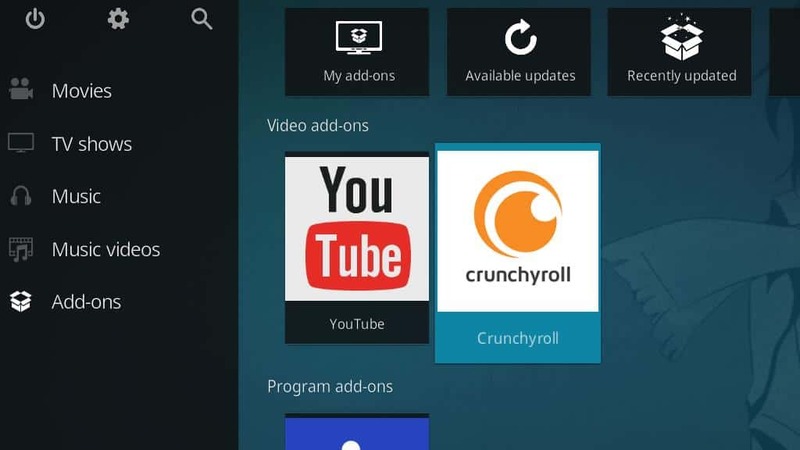 It’s fast, responsive, stable, and does a great job of bringing all of the thousands of anime titles on Crunchyroll to your living room or mobile device.